Something I have been thinking about recently: the coincidence that the US entered the first and second world wars despite first declaring their neutrality. So why did they bother to change their minds? Because wars are extremely profitable for powerful, influential people and especially for banks. You might disagree and say this wasn't the reason, and that it was because of the sinking of the Lusitania (WW1) and the attack on Pearl Harbor (WW2). But, like perhaps 9/11 as well, these may have been manufactured or encouraged to take place as reasons for going to war. I wrote previously about Pearl Harbor and how possible warnings were given of the attack in newspapers. Passengers of the Lusitania were also warned beforehand of a possible strike by German submarines. "Notice! Travellers intending to embark on the Atlantic voyage are reminded that a state of war exists between Germany and her allies and Great Britain and her allies; that the zone of war includes the waters adjacent to the British Isles; that, in accordance with formal notice given by the Imperial German Government, vessels flying the flag of Great Britain, or any of her allies, are liable to destruction in those waters and that travellers sailing in the war zone on the ships of Great Britain or her allies do so at their own risk. Imperial German Embassy, Washington, D.C. 22nd April 1915." 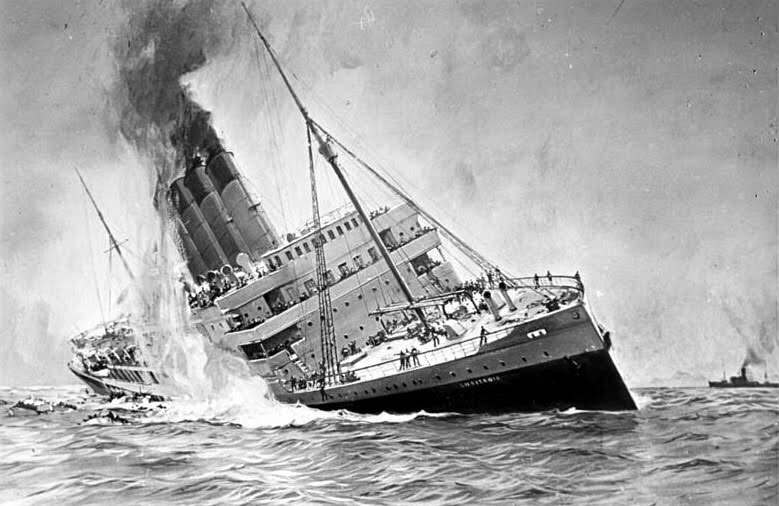 Despite the warning the Lusitania still set sail on May 1st 1915 and was subsequently sunk on May 8th, 11.5 miles off the Old Head of Kinsale, Ireland. 1,198 people died, including almost one hundred children. 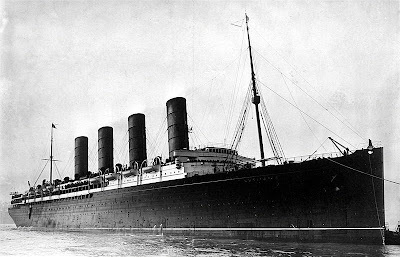 Germany justified the sinking by stating that the Lusitania, "...was yesterday torpedoed by a German submarine and sank ... it was naturally armed with guns, as were recently most of the English mercantile steamers ... as is well known here, she had large quantities of war material in her cargo." I've only written the bare bones in this post, there is much more on the subject on the Internet. Why did the US get involved with the likes of World War I, World War II, Vietnam and the supposed War on Terrorism (Iraq etc)? In each case there was a tragedy - for the want of a better word - that persuaded them to do so - or was used as a justification. These certainly weren't coincidences. Who are the people or organisations who have gained from these wars? When Lusitania was built, her construction and operating expenses were subsidised by the British government, with the proviso that she could be converted to an Armed Merchant Cruiser if need be. Prior to her final sailing the Lusitania was returned to civilian colours. Her name was picked out in gilt, her funnels were repainted in their traditional Cunard livery, and her superstructure was painted white again. Makes you think, doesn't it? At times it's as if we are being manipulated! Great post. Why are we now in three wars - Afghanistan, Iraq, and Libya. The country, the pundits say, is broke, can't afford health care for their citizens, Congress hopes to strip away Medicare for seniors and replace it with vouchers, home prices continue to fall, people are still unemployed. Yet, we can afford 3 wars. Someone is profiting, for sure. Thanks Trish. Yes, someone's is profiting. Though I wrote about the US it's the same with the UK: in financial difficulties yet we are in Afghanistam, Libya and so on. There is always money for wars (and handouts to other countries) - but we choose those which are for 'our' benefit - or rather the benefit of some rich organisations. We 'attack' Libya but nor Syria or Mr. Mugabe. Strange old world!